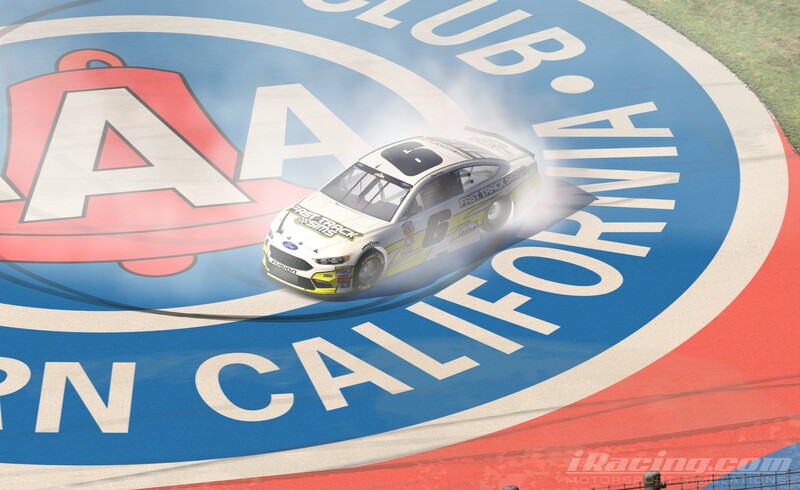 Ryan Luza looked every bit of the defending champion of the NASCAR PEAK Antifreeze iRacing Series in scoring his first win of the 2018 season at Auto Club Speedway. The champion started from the outside pole, took the lead for the first time on Lap 11, and was unchallenged for most of the race. 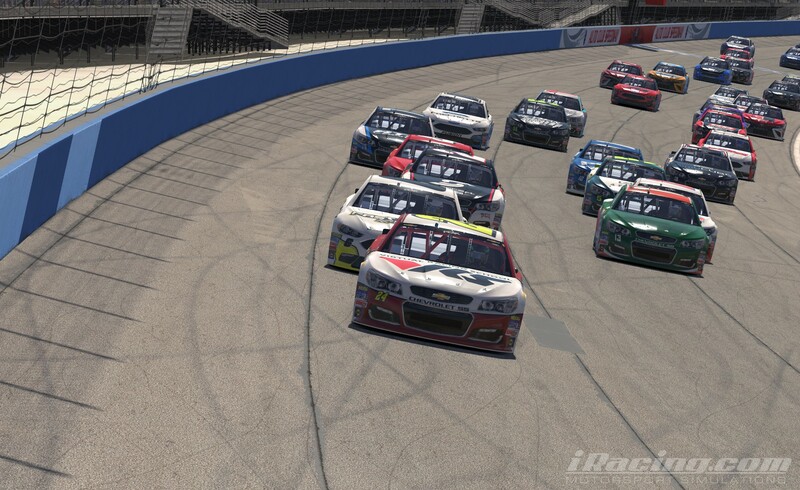 Ryan Luza (#6) was in championship form in a dominating victory at Auto Club Speedway. In all, Luza led 82 of 125 laps and beat Taylor Hurst by 1.5 seconds as Hurst did cut into the margin slightly during the last run. Ray Alfalla continued his strong start to the season with a third-place result. Jimmy Mullis finished fourth and polesitter Keegan Leahy came home fifth after leading the first ten laps. Luza spent much of the first run in command, but his race was not without adversity, as a mistake on pit road cost him the lead. On Lap 43, all lead-lap cars took advantage of the first yellow flag of the evening to pit for tires and fuel. Luza slid through his box and had to back up, leading to an extended stay on pit road. He exited in ninth but wasted no time marching back to the front. In just nine laps Luza had already climbed to second and was in hot pursuit of leader Zack Novak. The potential battle was interrupted by another caution which drew the leaders to pit road once again. This time Luza hit his marks perfectly and his crew got him off pit road with the lead. 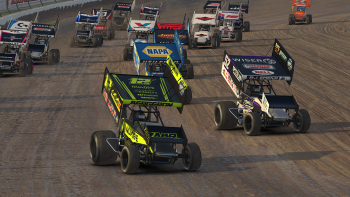 Front row starters Keegan Leahy (#24) and Ryan Luza (#6) lead the field into Turn One. 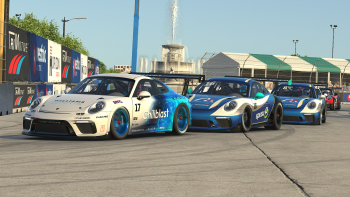 On the ensuing restart Mullis made a brief bid for the lead but Luza had too much speed and quickly opened up a healthy gap on the rest of the field. The race settled down into a long green flag run and it became apparent that any chance of upsetting Luza would require a caution or pit strategy. Leahy was the first of the leaders to hit pit road on Lap 89, hoping to gain an advantage with his fresh tires. Hurst followed on Lap 92 with Luza waiting until the lap after to make his stop. The three were less than second apart when Luza emerged from the pits with Leahy gaining a brief advantage before Luza flew by him with his four-lap fresher tires. Hurst could not keep up on the short run either and even though he looked a bit stronger than Luza on the long run, the gap was too much to overcome. Auto Club Speedway’s wide surface lends itself to three-wide racing as Michael Conti (#5) works the high side around Corey Vincent (#10) and Darik Bourdeau (#04). 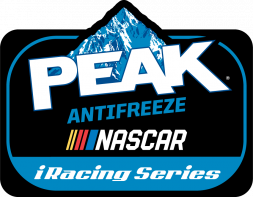 With three top fives in as many races, Keegan Leahy leads the NASCAR PEAK Antifreeze iRacing Series standings by 11 points over Alfalla. Luza’s win boosted him to third, but a rough Daytona keeps him 20 points adrift. Bobby Zalenski, Mullis, and Michael Conti complete the top five in the championship, with the latter two tied for fifth. With his dominant win, a second championship looks like a real possibility for Luza though the season is still young. Next up for the NASCAR PEAK Antifreeze iRacing Series is Las Vegas Motor Speedway, another track where downforce is a top priority. Will drivers who were strong at Auto Club Speedway also be strong at Vegas, or will the setups be different enough where some new faces will emerge at the front? 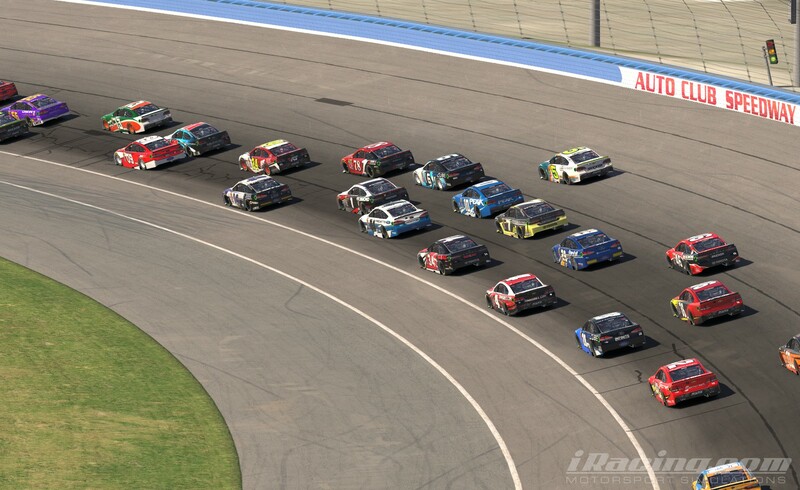 Find out in two weeks when the NASCAR PEAK Antifreeze iRacing Series continues from Las Vegas!